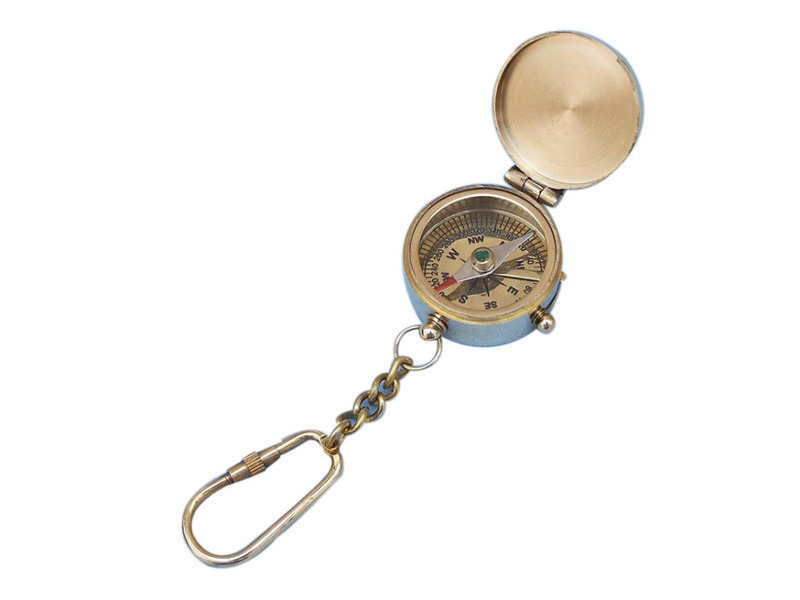 This nautical-themed key chain, featuring a compass key fob, is both adorable and functional. Crafted from solid brass, this key chain is as beautiful as it is durable and functional and a knurled knob allows you to easily and securely add or remove keys from the ring. These wonderful key chains make ideal gifts for all. Originally invented in ancient China, though not initially for use in navigation, the compass came to dramatically change the world. Making its way to Europe by the 11th century AD the compass helped usher in the Age of Discovery. Prior to the development of the first navigational compasses, from which this compass keychain is designed, sailors were forced to navigate by keeping within eyesight of coastlines and by following the path of the sun and known celestial bodies. With the invention of the dry compass, circa 1300 AD, the potential for oceanic exploration exploded, and much of the uncharted world became attainable. Using this simple yet elegantly effective tool, a new era of exploration began, connecting vastly distant cultures, lands, and ideas, and leading into the modern world. This dry compass keychain follows the original basic principles, with a needle floating on a low friction point above a card depicting the four cardinal directions. As the needle aligns itself with the Earth’s magnetic field this keychain compass points to magnetic North, allowing for precise navigation over open oceans even in inclement weather or at night. The best keychain compass will never let you down, and with a design that has been practically unchanged in its almost 2,500 year history, you will always find your way on the open seas. Continue the seafaring tradition with this compass keychain, keeping your keys safely secured, and always pointing your way home.